GoI Post-Matric Scholarships for Students belonging to the Minority Communities, Post-Matric Scholarships For Minority Students,Important dates for Post-Matric Scholarships, Last Date, AP and TS Post Matric Scholarships. 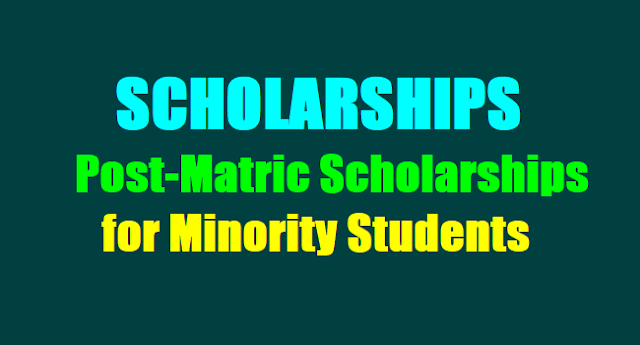 Post-Matric Scholarships: The Prime Ministers New 15 Point Programme for the Welfare of Minorities was announced in June, 2006. It provides that a postmatric scholarship scheme for meritorious students from minority communities would be implemented. The objective of the scheme is to award scholarships to meritorious students belonging to economically weaker sections of minority community so as to provide them better opportunities for higher education, increase their rate of attainment in higher education and enhance their employability. The scholarship is to be awarded for studies in India in a government or private higher secondary school/college/university, including such residential institutes of the Government and eligible private institutes selected and notified in a transparent manner by the State Government/Union Territory Administration concerned. It will also cover technical and vocational courses in Industrial Training Institutes/ Industrial Training Centres affiliated with the National Council for Vocational Training (NCVT) of classes XI and XII level. Scholarship will be awarded to the students who have secured not less than 50% marks or equivalent grade in the previous final examination and the annual income of whose parents/guardian from all sources does not exceed Rs.2 lakh. The concerned State Government/Union Territory Administration will supply the application forms, till such time computerized systems are made operational. The application forms should be received back along with requisite certificates/certifications within the stipulated period. Now Govt. of India has provide foacility to the Candidates for applying through online mode at its official website. Scholarship will be awarded to the students who have secured not less than 50% marks or equivalent grade in the previous final examination and the annual income of whose parents/guardian from all sources does not exceed Rs.2 lakh. Unlike scholarship for SC and ST, there are a fixed number of scholarships for minorities and hence preference for selection has been laid down. Students from BPL families, having the lowest income shall be given preference in the ascending order. The students should be regular in attendance for which the yardstick will be decided by the competent authority of the school/college/university. Income certificate should be on self-certification basis by way of an affidavit on non-judicial stamp paper for self-employed parents and from employer for employed parents. The school/college/university authority will certify the claim of the student of being an outstation students not residing in hostel of the institution concerned on the basis of permanent address and parents address. Migration of students from one institution to another would not normally be allowed during the course of the academic year except under exceptional circumstances and in the interest of the students academic career. The State Government/Union Territory Administration will lay down the detailed procedure for processing and sanctioning of scholarships to eligible students. Course fee/tuition fee will be credited to the schools/colleges/institutions bank account. Efforts will be made for transferring it electronically through the banks. Maintenance allowance will be credited to the students bank account. Efforts will be made for transferring it electronically through the banks. The State Government/Union Territory Administration will maintain a separate account and records relating to the funds received from the Ministry and they will be subjected to inspection by the officers of the Ministry or any other agency designated by the Ministry. The student obtaining benefits under this scholarship scheme shall not be allowed to avail of benefits under any other scholarship scheme for the same purpose. The fund for distribution of scholarships in subsequent years will be released after receiving the utilization certificate for the previous year. The scheme will be evaluated at regular intervals by the Ministry or any other agency designated by the Ministry and the cost of the evaluation study will be borne by the Ministry under the provision of the scheme. The State/Union Territory shall place all relevant details of financial and physical achievements on their website. It is mandatory for all students to apply online on ..
"After submitting applications online, take print out of application & submit it in the Institutions/College."